Barack Obama's dangerous obsession with golf. It’s been a tough first year for President Obama, as critics throughout the body politic bemoan that Mr. Change-We-Can-Believe-In is looking more and more like Mr. Politics-As-Usual. With the coming new year, however, POTUS has a prime opportunity to regroup, reload, and revamp his image. He could start by ditching golf. Seriously. Its venerable White House history notwithstanding, golf is a dubious pastime for any decent, sane person, much less for this particular president. Why would a leader vowing to shake up Washington--to alter the very nature of politics--sell his soul to a leisure activity that screams stodgy, hyperconventional Old Guard? There are signs that Obama has been nursing a creeping golf addiction for some time now. He took up the game a little more than a decade ago as a newbie state senator hoping to bond with more rural, conservative colleagues. Next thing you know, he was hooked--playing for cash, fretting over his form, and goading staffers to cut out of work early for a quick round. During the 2008 race, Obama’s golf outings drew less notice than his battles on the hard court. But, now that he’s firmly ensconced in the Oval Office, the sticks have come out of the closet as Obama constantly looks to squeeze in a few holes: on Father’s Day, during the family’s summer holiday on the Vineyard, immediately upon touching down from his June trip to Europe. It is often noted that this president hit the links more frequently in his first nine months than the reared-on-golf George W. did in his first two years (after which W. conspicuously swore off the game out of respect for the troops). Currently ranked eighth on Golf Digest’s list of presidential golfers (sandwiched between Clinton and Reagan), Obama seems intent on moving up the ladder--despite reports that he’s something of a duffer. 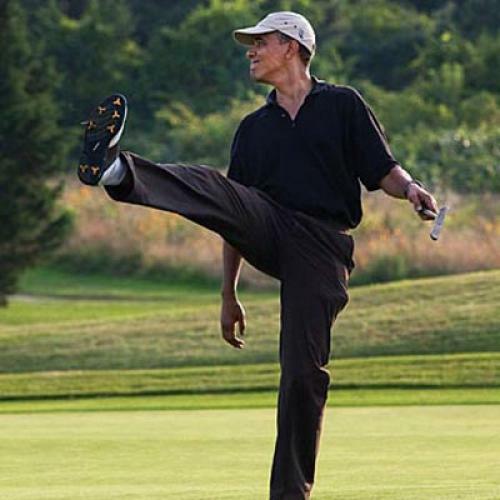 Various explanations have been floated for Obama’s embrace of golf: (1) Professional advancement. Ostensibly why Obama started playing, golf is indeed a time-honored way for ambitious political and business types to schmooze. In First Off the Tee, Don Van Natta Jr.’s book about presidential golfers, we learn that, as vice president, Richard Nixon went so far as to take lessons in hopes of impressing his golf-crazed boss, President Eisenhower. (2) Escape. All those hours of intense focus on getting the wee ball in the wee hole provide relief from the pressures of the office. (3) Testosterone. With all of the competition but none of the bruising of real sports, golf is what hard-charging alpha males turn to when they start getting too old to bang around in the paint. (4) Image control. Obama’s enthusiastic adoption of this most corporate of pastimes reassures middle-Americans that their history-making black president isn’t too urban, edgy, or cool. (As a bonus, golf is popular among retirees, who were stubbornly unwowed by Obama’s trail talk of hope and change.) (5) Tradition. With only three of the past 18 presidents not playing the game, golf is just something Americans expect our leader to do. But just because other presidents have done it doesn’t mean there aren’t political risks involved. In the popular imagination, golf is the stuff of corporate deal-cutting, congressional junkets, and country club exclusivity. And, unless a president is very careful, a golf habit can easily be spun as evidence of unseemly character traits ranging from laziness to callousness to out-of-touch elitism. As a senator, John F. Kennedy scored political points on Eisenhower by mocking Ike’s golf obsession--while taking pains to keep his own golfing gifts under wraps. (As Van Natta recounts, JFK forbade the media from photographing him at play.) Bushes 41 and 43 were both slammed for golfing during wartime. It has been posited that W. quit the game in part because of the stinging coverage of comments he made on the golf course in August 2002, following a suicide bombing in Israel. “There are a few killers who want to stop the peace process that we have started, and we must not let them,” Bush told the assembled journalists. “I call upon all nations to do everything they can to stop these terrorist killers. Thank you. Now watch this drive.” The tone-deaf clip eventually made its way into Michael Moore’s Fahrenheit 9/11. It was not one of golf’s finer moments. More broadly, for all the blather about how golf is soooo much less elitist than it used to be--a line being aggressively peddled these days by the head of Scotland’s Royal & Ancient Golf Club of St. Andrews in an effort to return the game to the Olympic lineup for the first time in over a century--it remains largely the province of reasonably affluent white guys. (Memo to the R&A: That whole golf-is-egalitarian pitch might be more persuasive if your club weren’t still boys-only.) There are fewer black faces on the PGA Tour now than there were three decades ago, and Augusta National’s 2003 fight to keep women out of its clubhouse did nothing to improve the game’s sexist rep.
And if we really want to get harsh about it: Golf is a dying game--on the skids for nearly a decade, according to a 2008 report by the National Golf Foundation. The number of Americans who golf has fallen by some four million, while the number who golf frequently (25-plus rounds a year) has plummeted by a third. One observed problem: evolving family dynamics. Men once free to spend all weekend on the links are now expected to help shuttle the kids to soccer, walk the dog, and generally pull their weight on the home front. The first lady may be understanding about her man’s special recreational needs. But does President Obama really want to be associated with a game so antithetical to modern life?